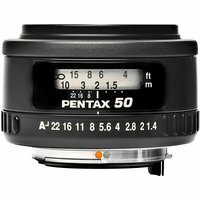 The Pentax 50mm f1.4 SMC FA Lens is a quality fast aperture prime lens. On film cameras the 50mm focal length offers roughly the same field of view as the human eye, and on digital cameras with APS-C size sensors this lens becomes a useful portrait lens with a focal length equivalent of 75mm (in 35mm film terms). Either way, the maximum aperture of f/1.4 offers superb low-light performance and fantastic softness in the out of focus areas of the photograph, another quality that lends itself well to portrait work. What's more, the FA 50mm F1.4 lens features the acclaimed Pentax smc multi-layer coating to lower surface reflection, reduce ultraviolet rays and deliver clear, high-contrast images, whatever your subject.